Bank of America is one of the world's largest financial institutions, serving individual consumers, small- and middle-market businesses and large corporations with a full range of banking, investing, asset management and other financial and risk management products and services. 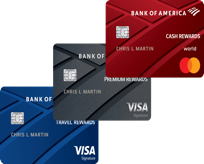 Here are some featured cards from Credit Karma's partner, Bank of America. Get a $300 statement credit when you make at least $3,000 in net purchases within 90 days of your account opening – with no annual fee, and cash rewards don't expire. Redeem your cash rewards as a statement credit, check, or have cash deposited into your a Bank of America® checking or savings account.